Submitted by: Bryon Moyer, Editor of EE Journal. I cut my engineering teeth on programmable logic and circuit design (bipolar, ECL). Nothing happens in those fields without tools, and so we have a massive EDA industry. OK, not as massive as they might like, given their constant kvetching about how the market never seems to grow, but it’s sizable and well established. So I’m used to an environment dominated by a few big companies. The little companies around them mostly act like quantum fluctuations to feed the big guys. You start a company, and if you’re successful, you’re sucked into a big guy. If not, you blink out of existence like so much energy dissipating back into the ether. Those few companies that never manage to disappear, but keep trundling along, run the risk of being treated as walking wounded. Having spent a couple years now trying to parse the MEMS industry for EE Journal, I’ve found a very different dynamic. And any stroll through the Sensors Expo (this year’s edition just finished up) will reinforce that fact. Just when you thought you knew the players, you find out how many more there are that you had no idea existed. It feels to me like this is a result of the long years of slogging that has characterized the MEMS industry. Until recently, there has been no hockey stick. A very few relatively recent high-volume applications like airbag accelerometers have given hope to the stalwart that their efforts can achieve commercial success, but it’s been hit and miss, and not all boats have been lifted by the rising tide of visibility for the industry. Next are some companies that managed to strike it rich in smartphones or Wii or some other specific application that took off. Guys like Kionix and InvenSense. They’re visible at conferences and they put a fair bit of energy into the marketing of their technology. In fact, to my mind, that’s one of the things that sets them apart: aggressive marketing. Then there’s a long tail of companies that have been doing yeoman’s work deep in the caverns, with no IPOs or champagne sales conferences and scarcely a pat on the back. Each one has a particular niche or angle or variant on the technology. You might look at them and think they could do with a bit more sophistication, but the fact is, they’ve been scrambling for years on a shoestring, and fancy ad campaigns just haven’t been in the budget. These are going to be make-or-break times for such companies, in my opinion. It’s like they’ve come up from the caverns, blinking in the sunlight, realizing that there’s a whole new environment in which to work, full of both promise and challenge. As MEMS gains legitimacy and becomes mainstream, the pressure is likely to grow on everyone to perform more like the more visible folks. Marketing becomes more important as messages get refined and cast farther afield. Granted, it’s a bit Catch-22, since you need the success to fund the marketing, but you need the marketing to achieve the success. If this were EDA, everyone would be predicting the imminent demise of most of the little guys. But it’s not EDA, it’s MEMS, and MEMS seems to play by its own rules. But as more visible companies have their day in the sun, they’ll cast their shadows over the smaller folks, and so the managers in the long tail will have to work harder to prove their value. I have blogged on the first two sensors before (Xtrinsic pressure sensor/altimeter: Part 1, Xtrinsic pressure sensor/altimeter: Part 2 and Magnetic sensor makes electronic compass design easy). I haven’t talked about the MMA8491, so it’s about time since it’s a really neat part. Unlike most other accelerometers, this little guy is designed to measure acceleration on demand, NOT based on some internal timer. The original target application was tamper detection. The device has 3 output pins which provide tilt detection at 45 degrees. Just toggle the EN enable line, and the X/Y/Z output signals are automatically updated. At 400nA per sample, this device has amazingly low power demands. And if your application does have a microcontroller, then just use the I2C port to read 14-bit sampled accelerometer values. That works out to be1mg/LSB sensitivity. element14 provides a 27-page user manual to take you through the paces of setting up and talking to your board. The board connects to your PC via a cable adapter from standard to mini USB. The board enumerates as a mass storage device, and element14 provides a precompiled command interpreter that can be downloaded to the Freedom development board via drag-and-drop from your PC desktop. The demo utilizes a virtual serial port over the USB line. You should be able to use almost any terminal emulator package to communicate to the board. My contact at element14 has used Termite and Teraterm Pro. I used RealTerm. The screen dump above shows a sequence of MPL3115 altitude and temperature readings. You will notice 3 “altitude levels” at approximately 398, 397 and 396 meters. These correspond to me holding the board above my head (while seated), on my desktop, and on the floor of my office. In other words, we’re seeing about two meters difference in height, as expected. The MMA8491Q accelerometer can be sampled up to 800 times a second, and the MAG3110 has a max sample rate of 80Hz. So you’ve got enough bandwidth to implement an eCompass. But the combination of sensors on this board work out really nicely for tamper detection, smart grid and smart metering applications as well. 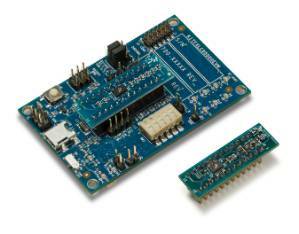 The kit includes both sensor shield and KL25Z Freescale Freedom development platform and cost only $26.99. You can order it now at www.element14.com/SensorEVK. In the second article of the MEMS new product development blog, the importance of the first prototype will be discussed. Theoretical work is valuable and a necessary step in this process but nothing shows proof of principle and sells a design like a working prototype. Its something people can touch, observe and investigate while distracting them from doubt associated with change. Building multiple prototypes in this first phase is equally important to begin validation early and show repeatability or provide evidence to change design and process directions. The first prototypes should include both non functional and function samples. The non functional samples are used to test one or more characteristics such as burst strength of a pressure sensor element. Fully functional samples can be used to test multiple performance interactions. An interaction is likely to include how the packaging of a MEMS device influences its accuracy or how exposure to environmental conditions effect sensor performance over life. Lets look at a few examples of how prototypes can influence proper decision making and expedite new product development. When working with an OEM on the development of a MEMS sensor, the team hit a road block with the customer pursuing one design direction (for very specific reasons) and the sensor team trying to make a change to improve sensor performance in fluid drainage. The sensor package had two long, narrow ports of specific diameter and the customer was resistant to change because of envelope size constraints and the need to retrofit legacy products in the field. However, the diameter of the ports was the most important factor in improving drainage. Engineers on both sides threw around theories for months with no common ground achieved before a prototype was made. Then a prototype was built with several different size ports and a drainage study was completed. A video was made showing visual evidence of the test results. It turned out that making a 2 mm increase in port diameter resulted in full drainage with gravity where the previous design held fluid until it was vigorously shook. When the customer saw the results of the prototype testing in the video, a solution to open port diameter was reached in just a days including a method to retrofit existing products in production. For another application, the engineering team needed to develop a method to prevent rotation of a MEMS sensor package. The customer requested that rotation be eliminated with a key feature added at the end of a threaded port. One method to achieve this is through broaching. This method involves cutting a circular blind hole, using a secondary tool to cut the material to a slightly different shape such a hexagon and then removing the remaining chip with a post drill operation. When the idea was first introduced, most experts stated it was crazy to attempt such a feature in hardened stainless steel and no quoted the business. However, the team built a prototype to test the idea. Our first prototype successfully broached 3 holes and then the tool failed due to a large chip in the tool’s tip. The team examined the failure and learned that the chip in the tool resulted from a sharp cutting edge. The material was also suboptimal for this broaching process but it was obtained quickly. Learning from these mistakes the team choose a more robust material and slightly dulled the cutting edge. These changes improved tool life from 3 to 92 broaches. This was a significant improvement but not to the point of a robust manufacturing process. Again learning from the prototype the team saw evidence heat was playing a role in the failure. This led the team to change to a more robust lubrication (something similar to the consistency of honey). This single, additional change improved tool life from 92 to over 1100 broaches and it was learned that increased tool life could be obtained with periodic sharpening and dulling the edge slightly. With further development, over 12,000 broaches were obtained in a single sharpening with tool life lasting over 96,000 broaches. Hence a prototype quickly showed proof of concept but also led to process and tool design changes that provided a successful solution. The last example is of a fully functional, prototype MEMS pressure sensor. Prior to building a prototype, analytical tools such as finite element analysis were used to predict interactions between the packaging and sense element when large external loads were applied to package extremities. These models are highly complex and often misuse of the tool by non experienced users results in team skepticism of the results. Colleagues may refer to work of this nature as “pretty pictures” but not very meaningful or doubtful at best. However, when performed properly with attention to meshing, material properties, boundary conditions, applied loads and solvers accurate results can be obtained. This allows for multiple design iterations analytically prior to the first prototype to ensure the sensor has the highest probability of achieving the desired performance. After finding a design solution where the packaging had less than 0.1% influence on the MEMS sense element performance, prototypes were built to validate both the optimized (slightly higher cost, better predicted performance) and a non optimized design (lower cost, lower predicted performance). Upon validation of both prototypes the team found over 90% correlation between experimental and theoretical results. In addition, the first prototype (although having some flaws) was very functional and performed well enough to be used in a customer validation station. With high correlation between theory and experimentation, the once questionable results were validated as trustworthy and further FEA could be performed for design optimization. In each of the case studies reviewed above, it was seen that early prototypes led to a wealth of information for the engineering team and proof of principle. In some cases, proof of principle is not obtained and design / process direction needs to change which is equally valuable information. The first prototypes can also be extremely valuable for influencing colleagues, customers and managers to pursue a particular design or process direction when theory can be disputed at length. In the next article of the blog, critical design and process steps that lead to successful first prototypes will be discussed. 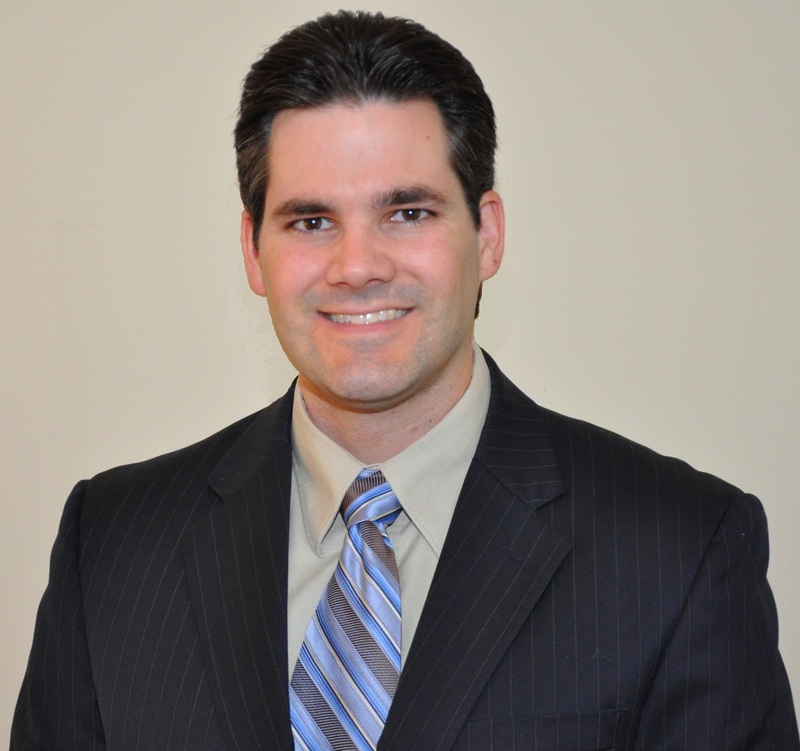 David DiPaola is Managing Director for DiPaola Consulting, a company focused on engineering and management solutions for electromechanical systems, sensors and MEMS products. A 16 year veteran of the field, he has brought many products from concept to production in high volume with outstanding quality. His work in design and process development spans multiple industries including automotive, medical, industrial and consumer electronics. Previously he has held engineering management and technical staff positions at Texas Instruments and Sensata Technologies, authored numerous technical papers and holds 5 patents. To learn more, please visit www.dceams.com. Originally posted as a guest blog on Design News. You have probably heard of the concept of Big Mother as coined by Julie Ask of Forrester Research. Though it is not as ominous as Big Brother — which smacks of scary omniscience — there is still some interplay between technology and personal behavior. According to Julie’s definition of Big Mother, sensor data is integrated into applications to guide us gently into better behavior. We are reminded to sit up straight by our LUMOback waistbands, or we work out smarter thanks to our FitBit wristbands and BodyMedia armbands. These are cool and compelling, but how is my mobile device going to guide me to the nearest exit of an over-Yankee-Candled indoor mall or help save the battery on my smartphone by powering down when its inborn intelligence infers that I am at the movies? When and how is my mobile device going to get to know me and help me in my world? When is Big Mother going to get street smart? Pedestrian navigation, anyone? Movea’s data fusion solutions, which include data and processing models, engines, and ecosystem-enabling tools for rapid prototyping, development, and integration, may be just the thing for context-aware applications. Well, the answer is nigh, because MEMS is enabling smartphones to deliver information to the user that is more personalized and more contextually aware. 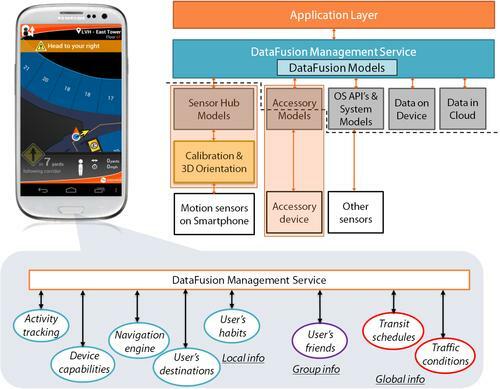 But to understand the capabilities of MEMS context awareness, we must start with the basics: the MEMS hardware in the mobile devices that will capture the data. The market for MEMS accelerometers, BAW filters, gyroscopes, magnetometers, microphones, microdisplays, and pressure sensors in mobile devices is expected to exceed $5.4 billion by 2017, according to Yole Development. Combine that growth with the push toward cloud computing and the increased pervasiveness of public data (GPS location, transit schedules, electronic billboards, etc.) and personal information (like location and purchasing habits). Now just imagine how much data can be captured. Yes, this is when you truly have to believe in Big Mother, who, though inherently benevolent, raises privacy concerns of her own. You can’t argue with the fact that technology is trending toward pervasive sensor-provided data. Now what do we do with all that rich data that MEMS sensors are providing? Context awareness is the MEMS industry’s new frontier for both consumer and personal healthcare/quality-of-life applications. Want to personalize your smartphone so it rings only when it’s face up? That’s possible today. How about navigating multiple floors inside the Mall of America or enhancing the decision-making ability of a person with Alzheimer’s? That’s coming soon, I hope. Though we have only scratched the surface of context awareness, we already have examples of contextually aware smartphones, the latest of which is the new Samsung Galaxy S4. It is chock full of MEMS and sure looks smarter than then the average smartphone. According to a March 14 Samsung press release, the Galaxy S4’s “combination of sensors built within the device systematically and automatically monitors your health, surroundings and so much more to help improve your quality of life. Also, users can easily check their health conditions using [the] food diary, exercise diary and sleep monitor to stay fit and healthy.” It certainly seems like Samsung is leveraging the power of context awareness. Google and Apple can’t be far behind in announcing their own versions of context-aware smartphones. I am also confident we will see context awareness in applications beyond smartphones. Wouldn’t you want a context-aware car or a context-aware home? I imagine that, in the next five to seven years, we will start to see smartphones that contextually connect our automobiles to roads and to home. A true Internet of Things world will begin to happen only when we have context awareness, and yes, it is made possible by MEMS. That’s what I would call a street-smartphone. The following guest blog post, written by Freescale’s Michael E Stanley, originally appeared in The Embedded Beat on May 28, 2013. Almost three years ago, I introduced you to the MMA955x intelligent 3-axis accelerometer (Evolving Intelligence with Sensors, June 2010). 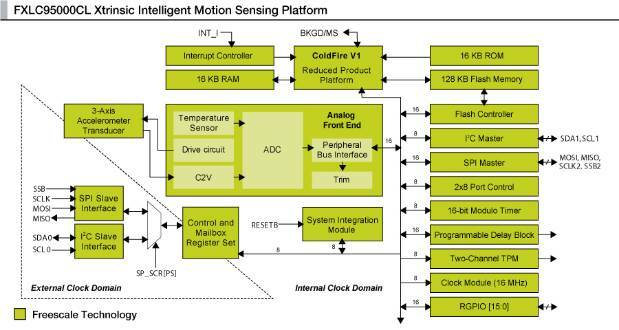 Several weeks ago, Freescale announced the next product in that line, the FXLC95000CL Xtrinsic intelligent motion-sensing platform (henceforth referred to as the “95K”). More than just a smart sensor, we’ve beefed up the design in a number of ways. That is most obvious in the device’s 3x5x1 LGA package. This is a bit larger than that of its older sibling (at 3x3x1). But you’ll see we need that extra space for extra GPIO, master SPI port and 8X the flash and RAM content. If you compare the 95K block diagram (below) with that of the MMA955x, you’ll see a LOT of similarities. It’s basically the same design, just WITH MORE. If you attach a MAG3110 magnetometer to the master I2C port and drop in Freescale’s free eCompass software, you’ll have everything you need for an electronic compass. The development board for the 95K is shown below. The master I2C is brought out on connector J8. The master SPI is brought out on J12. The board includes a dedicated MCF51QE128CLH which acts as a bridge between your PC’s USB port and the slave port of the 95K. When it was introduced three years ago, the MMA955x was the first of its kind. There were no other products like it. We designed that device for drop-in compatibility with the standard 3×3 accelerometer packages of the time. That constrained memory to 16K bytes flash, which is fine for numerous applications, but limiting for others. The 95K blows the lid off those constraints by increasing the amount of flash and RAM by 8X, and doubling the clock speed of the MMA955x. I am really looking forward to seeing what kind of creative products get built using the 95K. You will find 95K details at the Freescale FXLC95000CL product page. Development board details are available at KITFXL95000EVM product page.